Hi, my name is Teri. 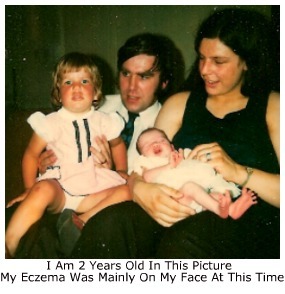 For all of my 43 years I have had my life affected by eczema. I decided to start this site to help people who are sufferers themselves or who know or who care for an eczema sufferer. I wanted to build a site that will give information about all aspects of living with eczema. Along with the information I have also included some of my own personal experiences. Experiences I have dealt with in the past and some that I am still dealing with. Medical professionals can provide some helpful information, but no amount of training can tell you what it is like to live with eczema on a day to day basis. My eczema's severity has changed throughout my life. Sometimes its a few small dry patches. 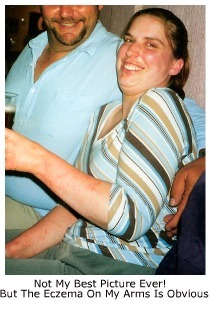 At other times my face has been covered, or my hands and arms have been badly affected. Although it effects my life on a daily basis I am lucky that I know what most of my triggers are. I also the treatments that work best for me. It does affect what I do. This includes what products I use on my skin, what I do in my spare time and sometimes how I feel. I wanted to be a chef when I left school. I got a job in a kitchen and was all set to work towards a NVQ qualification. It only took a few weeks for the heat of the kitchen to severely affect the eczema on my hands. They were red raw. I had to accept that being a chef wasn’t for me. Over time I learnt to accept that I was going to have live with it for probably the rest of my life. It is just part of me and my life. My parents were told that I would most probably grow out of it before I was 7 years old. That didn’t happen. We were then told I would be 14 years old, and then 21. When I reached 21 it was showing no signs of going. I think I was around 18 or 19 when I finally accepted that it was very likely I would have eczema for the rest of my life. It was then that I decided I needed to look more into it myself. I needed to find out more about why I had it. And more importantly, what I could do to help improve it and manage it. Having more knowledge meant I was able to limit outbreaks. I still have outbreaks. But much less than ever before. Because of the experiences I have had from living with eczema, and because of everything I have learnt I decided to put it all together. And here is the result. I have built my website using Solo Build It. I had been looking for a simple way to start. I knew nothing about where to start. I came across it completely by accident. But it has been the best accident to happen to me. Without Solo Build It this site would not exist. I love writing about all aspects of eczema. I love the feeling that someone could get some information from the site that could help change their day to day life for the better. I hope you enjoy reading my site, and get a lot out of it. And I hope one day you decide to add some of your own knowledge and experience to it, that will in turn help someone else.